Pineapple, cheese, brown sugar...three ingredients that probably sound like they don't go together and wouldn't taste good either. 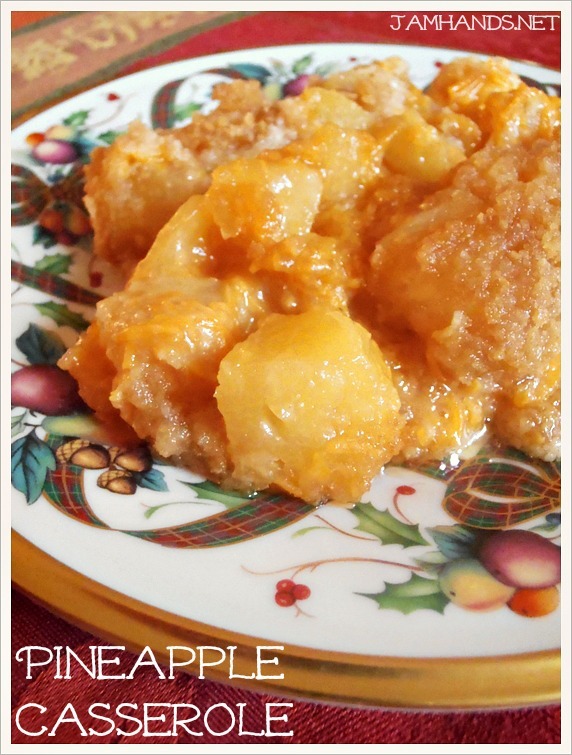 I've seen recipes floating around for years that referenced pineapple casseroles, but I wasn't brave enough to try it, until recently. To get straight to the result - I enjoyed this dish. It was different, that is for sure, but it tasted good and I can see why so many people make it. I crushed my cracker crumbs too fine so I was missing a bit of texture there. I went with brown sugar instead of white. I imagine that if you can get your hands on fresh pineapple it would be even better. Enjoy! 2. Grease a medium-size casserole dish with butter. 3. In a large bowl, stir together the sugar and flour. Gradually stir in the cheese. Add the drained pineapple chunks, and stir until ingredients are well combined. Pour the mixture into the prepared casserole dish. 4. In another medium bowl, combine the cracker crumbs, melted butter, and reserved pineapple juice, stirring with a rubber spatula until evenly blended. Spread crumb mixture on top of pineapple mixture. Bake for 25 to 30 minutes, or until golden brown. Side dish. I would think this would be tasty as a side dish to a nice ham. I made this as a side dish for Easter. It was a big success. Even picky eaters loved it. I used brown sugar and did not pack it when measuring, since the pineapple is already sweet. Hand grated sharp cheddar is much better than store-bought shredded cheese. This could even pass as a dessert. Love the versatility and uniqueness of a fruit dish...tasty hot or like warm...fit perfectly in my square 8x8" Pyrex dish. Thanks for sharing!